For 150 years, the Ferry House has nestled into Ebey's Prairie (bottom by Mitch Richards). 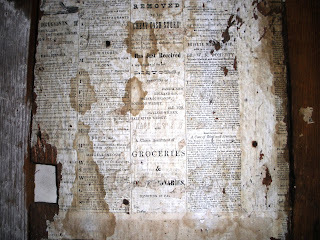 Old newspaper is still visible lining the walls in the upstairs of the Ferry House (top). Buffeted by storms, struck by lightning, enlarged by careless carpenters, neglected and, at last, abandoned, this 1860 structure teetered on the doorstep of its own demise. Enter the National Park Service and Nature Conservancy which, in the very nick of time, rescued the Ferry House from ruin. Old buildings are sometimes the best - at times the only - eyewitnesses to their own history, exposing the past to the present by the testimony of their walls. Architectural elements like staircases and porches leave evidence behind when they disappear, and restoration experts search for these clues to learn what the building looked like during its evolution through time.